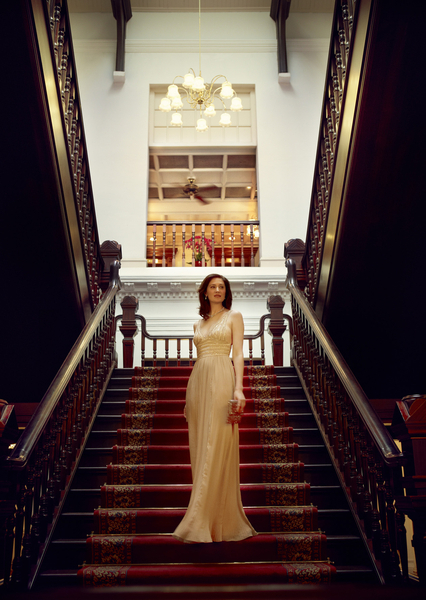 We’re shown, not to the Presidential Suite, where William and Kate recently stayed, but to the Somerset Maugham suite, number 102, overlooking the Palm Court. 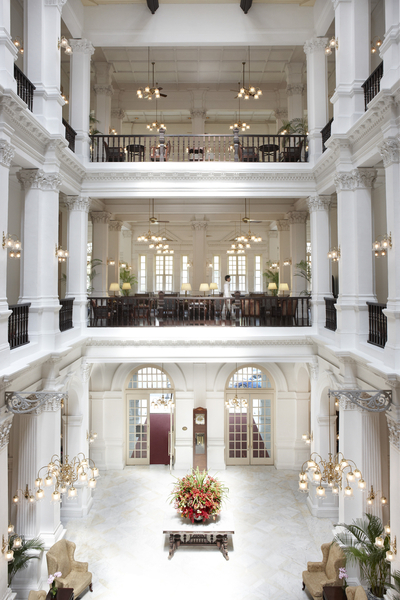 There have been many additions and alterations since Raffles first opened 125 years ago in December but this wing is the most serene. The view invites you to sink into a rattan chair on the balustraded veranda and sip a welcome Singapore Sling brought to you by your butler. So we do. 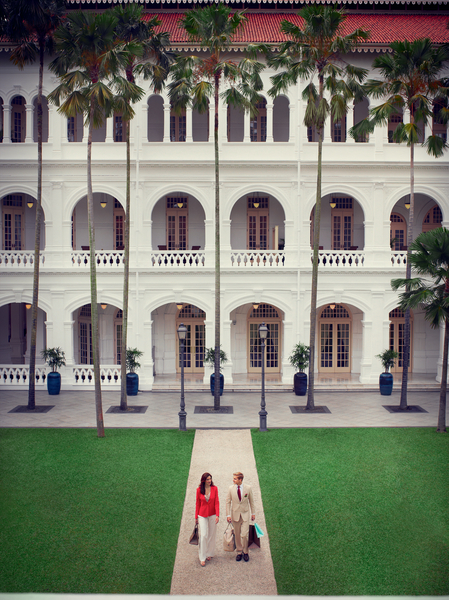 All the suites (there’s nothing so hum drum as a room at Raffles) are vast compared to modern hotels. They come with a veranda and a sitting room to the front and a huge bathroom to the back. Don’t expect a zen wetroom but instead Victorian tiles, a liberal amount of marble and brass fittings. 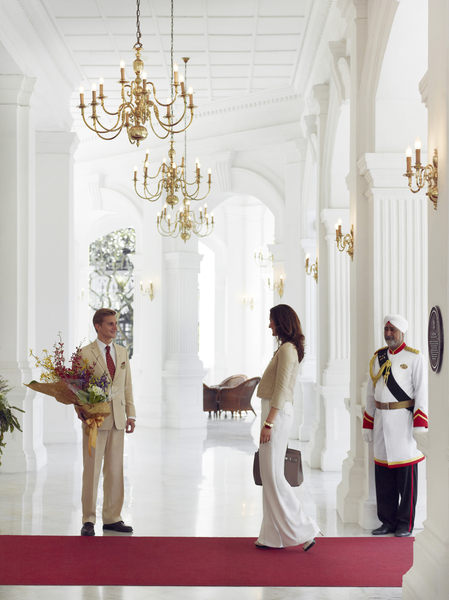 Number 102 was Somerset Maugham’s favourite and is now the hotel’s most frequently requested suite. As well as the usual dark wooden floors, half tester bed, oriental rugs and antiques, our suite has framed pictures of and letters from W Somerset Maugham lining the walls, a writing desk and a smattering of the author’s novels. I suddenly feel under pressure. Time for a cocktail. We cross the courtyard into the main building to the Writers Bar. Some people will encourage you to visit the famous Long Bar and throw peanut shells on the floor but the Writers Bar is lovelier; an exclusive little nook off the lobby. 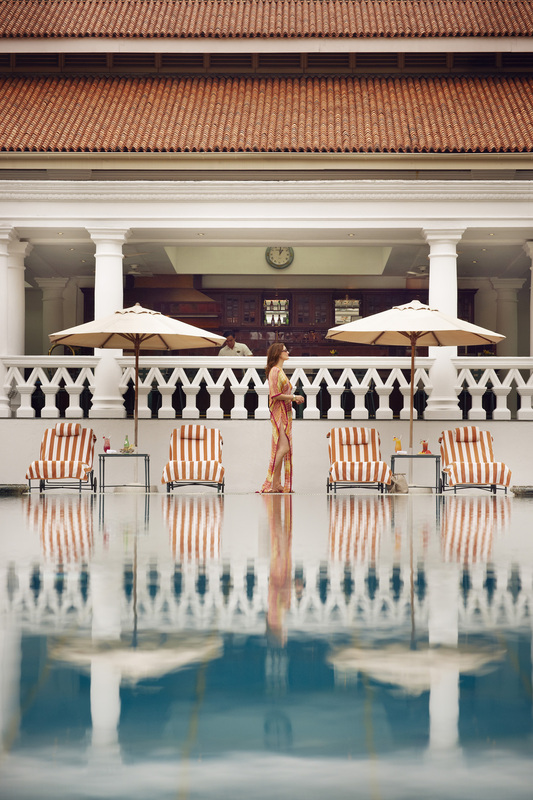 Billecart Salmon Ultra Brut champagne is on offer here – an exclusive in Singapore. Wine director Stephane Soret, winner of the prestigious Wine Spectator Excellence Award, cleverly chose it for its lightness in the searing Singapore heat. 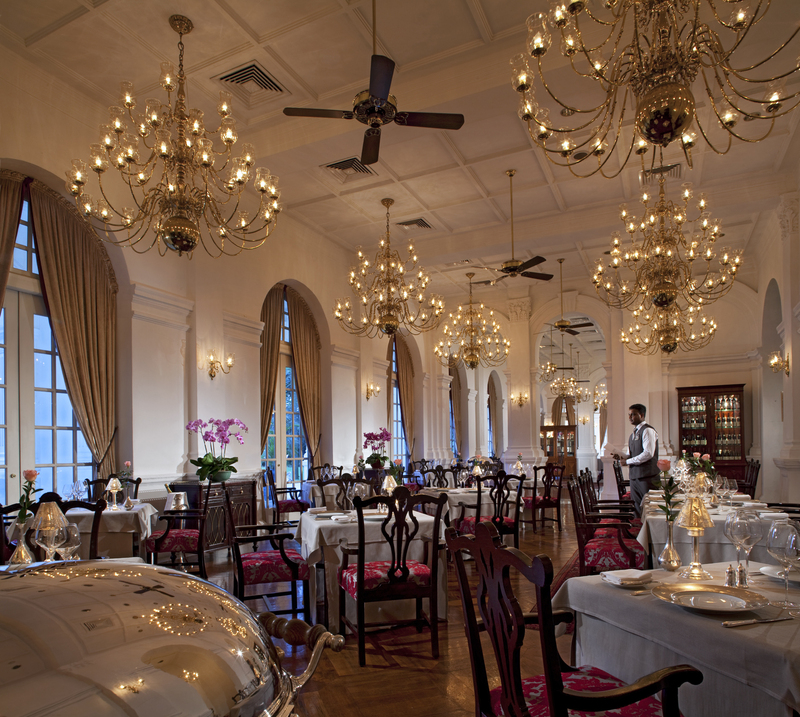 After the resident pianist plays Noel Coward’s I’ll See You Again at 8pm on the dot, we move into the adjoining Raffles Grill for dinner. An engaging waitress talks us competently through the menu and to start I choose the steamed foie gras which has a delicious salty topping and served with a pear that’s been poached for two hours in red wine. Eric, the young and enthusiastic Chinese sommelier, matches it with a sweet wine. I usually steer clear of the foie gras-dessert wine combo but this has a tropical fruit tang that’s not at all cloying. 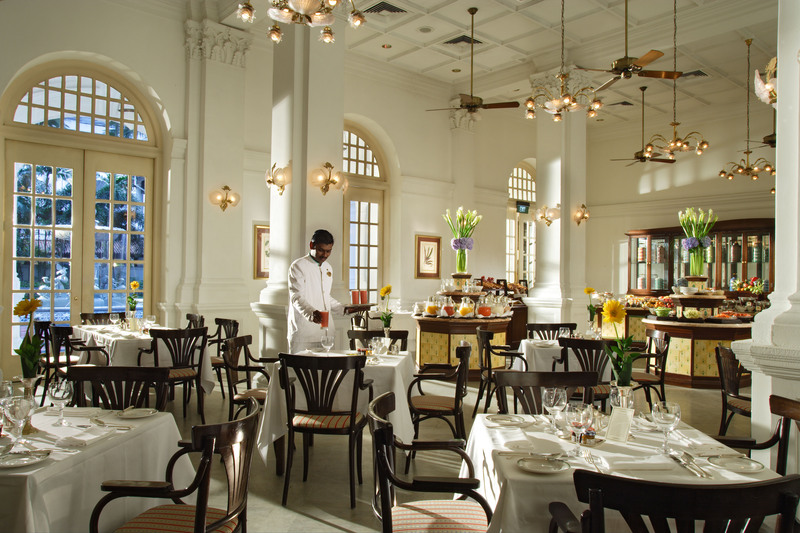 I’m just about hungry now so we go for breakfast in the Tiffin Room – an airy, colonial style restaurant with white pillars and ceiling fans on the opposite side of the lobby to Raffles Grill. There’s the usual five star buffet arrangement which is very well done but also an interesting a la carte menu. I order the Raffles Omelette – a spicy empire days inspired dish of eggs, peppers and chilli powder. Just the trick after a late night. We return to the Tiffin Room for lunch to try Raffles’ famous Indian buffet (while you’re staying here you should really eat inside the glorious main building as often as you can). The buffet is a spread of northern Indian hot and cold starters, chutnies, curries and vegetables with standouts such as cucumber masala salad and overnight-cooked black lentils. The highlight though is the chef’s specially prepared curry (on this occasion, a rum-soaked lamb dish) served as a generously proportioned amuse bouche, and mopped up with a freshly made naan breads. The grandfather clock in the lobby is chiming, signalling that it’s time to leave. I do so reluctantly. So long Raffles, I’ll see you again. ← Is there a need for Best Female Chef awards?